Photo courtesy of Bob Pristash and the Evansville Purple Aces' Men's Basketball twitter handle. Belmont down! Providence next! With today's win the Evansville Purple Aces have a very good victory to propel themselves to Anaheim and the DirecTV Wooden Legacy. EVANSVILLE, INDIANA---On December 9 of last year, the Craig Bradshaw-less Belmont Bruins were "upset" by the Evansville Purple Aces in Nashville, Tennessee. Today, Bradshaw was in action and looking to avenge his team's loss. Unfortunately for him, D.J. Balentine and Egidijus Mockevicius had other plans. 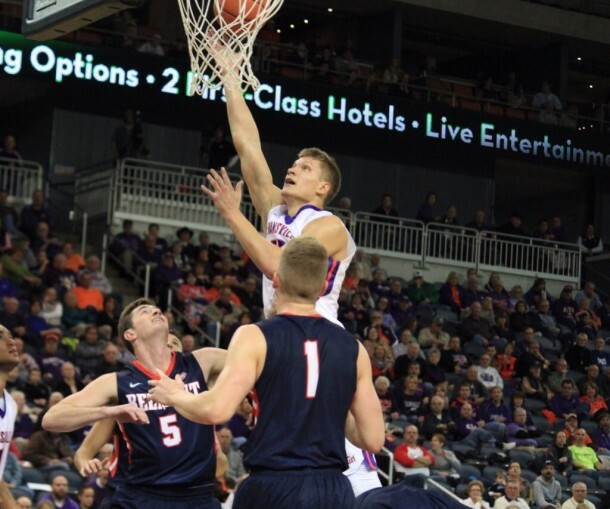 In a matchup that pitted two of the best mid-majors in the Midwest against each other, Evansville picked up a tremendous quality win over Belmont by the score of 93-88. Coming out of the gates, Balentine got the party started with a jumper on the team's first possession to set a fast paced tempo for the match. Following the Purple Aces being one step ahead of their opponent to start the showdown, the "Big Bs" finally made an appearance as Evan Bradds and Bradshaw stole a 10-8 lead before the under 16 TV timeout. Their lead would be short-lived though, for Mislav Brzoja did all the little things, such as make free throws, to bolster Evansville on a 16-6 run (24-16 UE) with 9:10 remaining in the first half. But the Bruins did not lay down, they made in-game adjustments, which held Balentine to only four points in a 16 minute stretch in addition to drawing them back within one (34-33 UE) after a dunk by Bradds and trey from Taylor Barnette. Rick Byrd's team was on the prowl to steal momentum before halftime; however, they could not as Jalon Brown netted three of his thirteen points to end Belmont's mini-spurt. Yet, Evansville did more than just end a run, they started a 11-2 burst to take a 45-35 lead into halftime. Exiting the intermission, momentum stayed with the Purple Aces by UE continuing to hold at least a seven point advantage until the 7:42 mark when Barnette nailed his second triple of the game. Nevertheless, Evansville was able to quickly up their lead to a game-high 13 with a corner triple by Blake Simmons. All the Bruins looked demoralized inside the Ford Center, that is everyone besides Evan Bradds. Bradds, who had a team-high 28 on the afternoon, single-handedly brought his team back from the dead with seven quick points to draw the score to 79-72. To quicken the heart rates of the home faithful even more, Belmont's Dylan Windler lessened the deficit to four (84-80) with 1:46 left in the game. Would Evansville really give the win away? No! Quickly the Purple Aces responded with six straight points to widen their lead back to ten. "Evansville has this game won!" is exactly what the case would have been against any other team but not Belmont. The Bruins, who are one of the best three-point shooting teams in the country, had a chance to come back in the final minute as a layup by Austin Luke and three-pointer by Kevin McClain put the team within five. Yet this afternoon, the Bruins ultimately got in their own way as they allowed a Mockevicius offensive rebound on a missed free throw attempt by Jalon Brown with 24 tics remaining. While Craig Bradshaw gets most of the national attention when it comes to an individual on Belmont, Evan Bradds played outstanding when matched up against 6'10" Egidijus Mockevicius. In fact, he wasn't just outstanding, he was perfect! No really, he was 13 for 13 from the field with a game-high 28 points and 14 rebounds! Look for more great performances from the "jazzy junior" as the season progresses. To defeat the "Big Bs," Evansville knew they would need huge performances from their Preseason All-Missouri Valley Conference first teamers D.J. Balentine and Egidijus Mockevicius. Forget about need because they received! The best big man/guard duo in the MVC combined for 55 points and 20 rebounds on 20 for 33 shooting from the floor. Make sure to keep an eye on the two stars when they go up against Providence on Thanksgiving in the first round of the DirecTV Wooden Legacy. "Yeah, definitely! This is definitely the first time this season so far that I have felt like. The first two games we really struggled shooting. This game, the flow of it was better." ---Evansville's D.J. Balentine when asked if today was the first time he and the offense fully clicked. "His basketball IQ is off the charts. I don't know what he weighs. I don't know how tall he is, but he plays against bigger, stronger, more athletic guys most nights, and he comes out with numbers like that. He shot 70%, I think, from the field last year. We tried to double (team) him at times, and he beat us there. You know, we will have to go back and watch the tape, but he is difficult to defend from catching it because he will go off the block and catch it. And he is just so skilled." ---Purple Aces' coach Marty Simmons on how tough it was to contain Evan Bradds. "I'm not sure. I haven't ever seen the guy play yet. I've heard nothing but terrific things. It will be our team. We can't defend guys like that one-on-one. So we will have to get some help (defense). People I've talked to, they think he is rated and some maybe even the number one player in the country. I got a lot of respect for Providence, their coaches and their players. We are just looking forward to the opportunity to play." ---Marty Simmons responding to "What is the key to shut down Kris Dunn?"